What was that 2,000 year old battery actually used for? We may never know, but we do know that batteries have been used throughout history in a number of different ways. John Frederic Daniell’s battery, the first practical version of the device, was used in telegraphs. A variant of the Daniell cell, the gravity cell, was actually still used in some telegraph way stations as recently as the 1950s. In 1859, Gaston Plante created a lead-acid battery. This battery was fairly heavy and rather bulky when compared to some others, but it had a few advantages: it could produce very large currents of power in surges, plus it could power multiple circuits at once. Today, automobile and forklift batteries are still based on Plante’s lead-acid battery, and the basic design hasn’t changed. 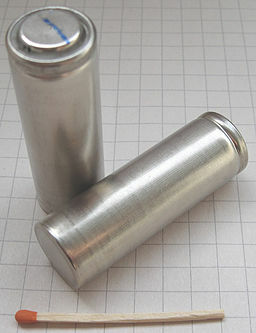 The battery created by Georges Leclanche has been used to power telephones and in other telegraphy applications, and the dry cell zinc-carbon battery created by Carl Gassner that built upon Leclanche’s battery is also still manufactured today. Batteries have been used to power many different things: telegraphs, cars, watches, household appliances, and even space exploration probes like the Mars rover. Because electricity is a clean form of energy, more and more people are looking to batteries to replace things that run on gasoline and other types of fossil fuels. This focus on new, green energy means we’re likely to see the battery industry continue to change and grow. Things like electric cars already incorporate new types of technology to make their batteries last longer, while NASA makes use of batteries that can power its space probes for years while refueling by collecting solar energy. But one of the most interesting advancements in battery technology was announced on May 1, 2015, when Tesla unveiled its newest battery products. Known for their advanced electric cars, Tesla has been a leader in the battery industry for the past decade or so. But this new battery, called the Tesla Powerwall, isn’t designed for cars. Instead, it’s a battery that, if all goes as planned, will be able to power a home. These batteries are designed to store either 7 or 10 kilowatt-hours, depending on which size is installed. While most people use an average of around 30 kilowatt-hours a day, that includes the use of heavy appliances like washing machines and dishwashers. If a family were to use only the basics, it’s very possible that one of these Powerwall batteries could run a house for a full day. It may not make it possible to go fully off the grid yet, but these batteries could be combined with solar energy cells to greatly reduce the dependency on power produced by the electric company. How Scientists Plan to Spark Future Battery Breakthroughs - What might break about the next major battery revolution?